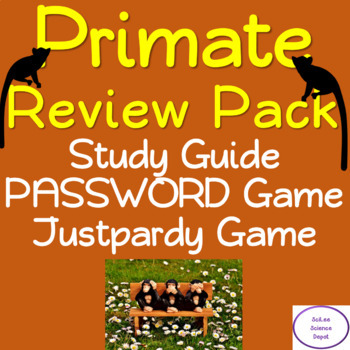 The Primate Review Pack includes a Two Page Study Guide, a PASSWORD Vocabulary Review Game PowerPoint, and a Primate Justpardy Review Game PowerPoint. The Primate Study Guide is two pages ling. 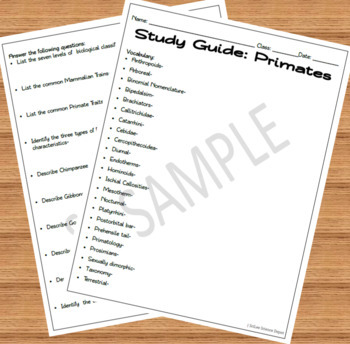 The front page has over 20 key Primate Vocabulary Words that the students need to define. The second page has 10 open response type questions the students need to answer. 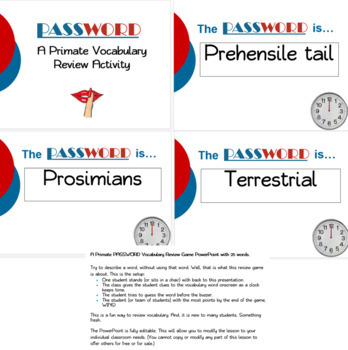 A Primate PASSWORD Vocabulary Review Game PowerPoint with 25 words. One student stands (or sits in a chair) with back to this presentation. The class gives the student clues to the vocabulary word onscreen as a clock keeps time. The student tries to guess the word before the buzzer. The student (or team of students) with the most points by the end of the game, WINS! This is a fun way to review vocabulary. And, it is new to many students. Something fresh. I found that doing the game this way, each and every student participates. This prevents that one student from dominating the game. This is a fun way to review for a test.